Hurray I got my Raverly t-shirt on Friday. I’ve been so busy though that I forgot to get a picture of me wearing it and now it’s in the wash :(. So I guess the photo is� to come later. I’ve started on another pair of pre-schooler mittens – they are fun to make because they go quickly. I’ve got aspirations to knit two cotton bedspreads for the girl’s new twin size beds and to knit a bathmat. I think I need my head checked. I’m so busy with work and life in general it’s hard to just sit and knit. I haven’t worked much on Jackson’s sweater. Life during the Fall is very busy for me, so knitting often slows down a lot during this time. Practicality has brought to my attention the need to knit mittens for the girls. One pair isn’t going to cut it now that they go to daycare and school. Little A misplaced her mittens for a week already and she barely needs them yet. 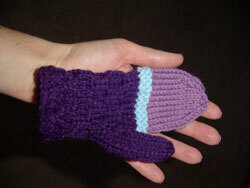 I’ve only made one mitten (pictured below). The mitts have no pattern really, I based them on Winter Set pattern I did last year, just changing the type of stitches I used, such as a honey comb pattern for the base without any ribbing.